For a yard that is already orange and yellow, fall mums in your gazebo are perfect for incorporating deep reds and purples into your fall landscape design. Fall is quickly approaching in Maryland as temperatures begin to cool and leaves begin to change all around the state. While it may be cooler and drier outside, there is still plenty of time to make the most of your outdoor space before winter! This season is perfect for accessorizing and decorating your deck and outdoor features, especially your gazebo. As you entertain throughout the fall with fun bonfires and spooky Halloween parties, consider these four easy ways to accessorize your gazebo as part of your fall landscape. 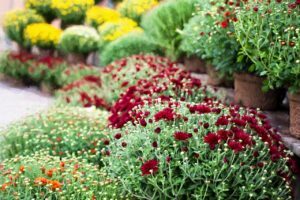 Mums are perfect fall flowers for incorporating some additional bright shades into an already colorful fall landscape. If the leaves around your yard are slow to change colors this season, it may be better to start incorporating fall colors into your space by placing orange and yellow mums inside and around your gazebo. For a yard that is already orange and yellow, fall mums in your gazebo are perfect for incorporating deep reds and purples into your fall landscape design. Accessories such as wheelbarrows, hay bales, and scarecrows can be fun additions to your gazebo this fall. Whether you are entertaining guests or simply creating a fun space for your family to enjoy, these accessories are perfect for capturing the essence of fall in your landscape. For a party or any other fall occasion in your yard, soft lighting is a creative way to create ambiance in your outdoor space. Hang string lights or festive fall lights around your gazebo to light up the inside during the evening. You and your guests will be able to enjoy an autumn night in your gazebo with beautiful fall accessories and soft lights in your space. If you already have fall furniture in your gazebo, consider incorporating a little bit of fall into your furniture by swapping out summer cushions for festive fall ones. Much like your flowers or fall decorations, this is the perfect way to add color to your festive gazebo this fall!